Louisiana: Union, justice, and confidence. 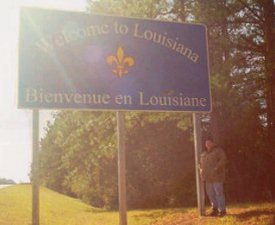 I left Texas for Louisiana at night, so it wasn't until maybe 8 or 9 when I crossed the border on I-10. The sign there is just like the one on I-55 that is pictured here. Again, this is one of the drawbacks to taking a "see-the-country" road trip in the middle of the winter. There's not enough daylight to do that. Even in the south, where the days are longer. I drove an interesting stretch of I-10 which I would like to see during the daytime. I surmise that is a stretch of perhaps seven miles that is elevated over the Louisiana bayou. Again, since it was at night, it may turn out that there is not much to see there in the first place. Louisiana was the home of the cheapest gas I saw on my Dallas trip. A gallon of plain ol' regular no-frills senza-piombo went for $1.179. I had already visited a number of what I call "non-traditional" state capitols. The most non-traditional so far in my quest is located on the eastern banks of the Mississippi River in the city of Baton Rouge, Louisiana. Louisiana's capitol is as different from the others as you can get, pretty much. No dome on the top of this baby. That's a 34-story, 450-foot high-rise. I pulled into Baton Rouge via I-10 and I-110 at about nine in the morning on Tuesday. Not much traffic on the streets of the capital of the Pelican State that forenoon, but it took some time to get to the statehouse after navigating all of the narrow one-way streets. Across the street from the capitol lies a collection of dormitories, known as the Pentagon Barracks. They are arranged - you guessed it - so that they formed a five-sided courtyard. Well, almost. One of the buildings is missing. There are forty-nine steps leading to the south front of the capitol, one for every state in the union. Well, almost. Alaska and Hawaii share the forty-ninth step, with the national motto "E Pluribus Unum" between the names of those two states. The first through thirteenth steps are for the original 13 colonies; they are listed in alphabetical order. Starting with the fourteenth step, each state is named in order of admission, from Vermont all the way up to that grand, noble state of Alaska-Hawaii. The south front overlooks a beautifully landscaped garden that stretches for about 250 feet down to Spanish Town Road. The centerpiece of the garden is a statue of Louisiana's most famous political son, Senator Huey Long. The capitol was Long's brainchild. He believed that a new building would save the public money in the long run, which was important as the country was in the throes of the Great Depression. He personally convinced several state legislators to go along with the idea, and the plan was approved. The capitol was completed in 1932 for just over $5 million. 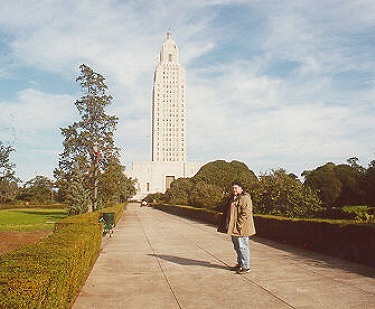 Ironically, Huey Long was assassinated on these same capitol grounds in 1935. He is buried here. This page loaded in 76.789 milliseconds.